Dietary treatment for Eosinophilic Oesophagitis (EO) was shown to be relevant when a fully hydrolysed formula produced improvement in around 90% of cases. With that realization of an allergy mechanism the six-food elimination diet (SFED) was used. This produced an efficacy of 70%. The shift to the SFED still implies that many foods are suspect, and also suggests that dietary treatment for EO is the same for everyone. Other research has reported that the improvement can be equally verified from patient reports of comfort as from histological response tests. New research takes the knowledge another step. It shows that excluding six foods may not be necessary. (See ‘Efficacy of IgE-targeted vs empiric six-food elimination diets for adult eosinophilic oesophagitis,’ RodrÃ­guez-SÃ¡nchez J, GÃ³mez Torrijos E, LÃ³pez Viedma B, de la Santa Belda E, MartÃ­n DÃ¡vila F, GarcÃ­a RodrÃ­guez C, Feo Brito F, Olmedo Camacho J, Reales Figueroa P, Molina-Infante J. Allergy; 2014 Jul;69(7):936-42.) This Spanish team’s research shows that by using serum IgE-targeted tests they were able to reduce the average number of foods excluded-per-patient to 3.8, and still get a remission in 73%. This shows that people may only need to exclude a lesser range of foods where ways of deciding on the exclusions can be found. It also reminds us that there is still the question of why the remission rate on the hydrolysed formula is 90% while on the SFED is 70%. To address this gap I hypothesise that it is because patients with allergy are often also sensitive to additives and the natural food chemicals: salicylates, amines, flavours and glutamates. The diet therapy for investigation of this condition is designed from what the patients present as causing discomfort to them, their Family Sensitivity History (which can give emphasis to which of the six foods may be relevant) as well as attending to the usual suspect foods that food sensitive people react to. It supports an individualised diet, and a case study that shows this process follows. My patient, Jack, was unable to manage the full family sensitivity history at the first appointment but knew much about himself that was relevant, and he knew his mother has a “very sensitive nose”. Jack provided much information about his symptoms and was already taking steps that decreased some symptoms. He was very frustrated as he did not know what to eat after an incident where he experienced “vomiting without notice” while flying on a passenger aircraft. The reaction also affected his eyes. He reported severe reflux with a feeling of “burning right up in the throat”. He also had “sharp” lower gut pain. He used to have seven to eight loose bowel motions/day until he reduced his coffee back to only four cups per day drunk in the morning. Now his bowel motions are normal and not loose. He had headaches every other day. He had hay fever with runny eyes and coughing, and he had had asthma when he lived interstate several years ago. He suspected fruit as he gets a ‘furry mouth’ after rockmelon, avocado, pineapple, raw carrots, cucumber and almonds. Mango is not liked. He had recently had a gastroscopy and had been told he has eosinoplilic oesophagitis. Since we did not have any indicators of a role for allergy to any whole foods and had indicators of food chemical sensitivity (reflux, gut pain and headaches, as well as suspect foods), I instructed him in the low-additive low-food chemical diet as the most useful starting point. If this produced no change I planned to consider which of the usual whole foods (milk, wheat, soy, eggs, nuts, or fish) seemed most indicated from his family sensitivity history, as well as how strict he wished to be in his work life, which often included travel. Jack attended his second appointment four weeks later. He had adhered to the prescribed low-chemical diet and now had none of his symptoms. He no longer felt afraid that he will have unexpected projectile vomiting. Overall this meant that we did not need to move to the much stricter SFED, which would have involved using a much stricter diet. However this had been planned for review if the baseline low chemical diet was insufficient or if relevant information was obtained from the Family Sensitivity History. Jack had not been able to collect his family sensitivity history and was happy with his great improvement. At the end of the diet trial period, he tested one meat patty and had burning pain for 10 hours – so herbs or aged bacon, or aged beef became suspects. He also noted that when he has a very busy day with no time to eat, he feels his “throat burning”. It was recommended that he carry water crackers and have with a drink to avoid fasting. He noted his “furry mouth” symptom with green beans even when they were with other tolerated vegetables. He was also advised to note the texture, temperature, and flavour of suspect foods to try and narrow down necessary exclusions. Overall his treatment has followed the direction that would have been consistent with a diagnosis of reflux, occurring with other food sensitivity symptoms. Jack was instructed with regard to general challenges and the recording of outcomes on a diet diary summary page. 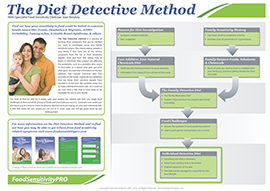 As part of the diet detective method, challenges were oriented to testing foods of particular relevance to his preferences and lifestyle. He was quite happy with the range of foods allowed on the diet. However there were specific foods Jack wished to test. These included light beer, tea and bananas. He was advised to begin with one beer diluted with tolerated lemonade as a ‘shandy’ drink. To test tea he was advised to try the mildest flavoured one (Lipton’s Yellow Label as the most tolerated brand). Banana does give him a furry tongue so the suggestion was to test if there was one stage in the ripening process where the banana is ripe enough to not cause the furry reaction, but not so ripe it has amines developing. He appreciated that each trial should take seven days so he is clear there is no irritation to the oesophageal membrane. Jack attended his third appointment five weeks later. He continues to have none of his worrying symptoms. He was reminded to continue to be aware of smell, taste and other factors which may guide likelihood of a reaction. He has become aware of many factors that make a difference. He has learned to eat small meals often, and not to eat fast, especially when hungry. Usefully he has worked out that he can tell in advance if he will react in that if he puts a suspect food into his mouth and allows a little time he can use a “prickly mouth” reaction as an indicator to stop. Where his mouth feels prickly he does not eat the food and all is well. This is particularly important as he does much travelling and cannot know what is in many mixed meals. He is managing spicy food unless he gets his prickly mouth reaction. This does relate to how strong the spicy food is. He does react to particular combinations of dry textures that he describes as ‘gluggy’ such as bread and chicken, or a chicken roll (he vomited after one incident), or a crab sandwich, whereas he does not react to bread or chicken, or crab when eaten separately. The texture of the wheat-containing food matters in that he has noted he manages different textures, such as dry biscuits with cheese, or toast with cheese, with no problems. He is using the ‘Best Guess Food Guide’ in the book Tolerating Troublesome Foods as a guide to individual foods. Overall he no longer has his earlier gut pain reactions. He is sure he reacts to any cucumber, raw tomato, or rockmelon. He ensures he always has some food and water available so he does not fast for too long. Foods that he has noted that do not cause reactions include cooked tomato dishes, cooked beans, cooked peas and broccoli, and mixed drinks even if somewhat spicy, as well as chocolate or coca cola. I did remind him that he has noted poor settling and sleep-resolving among initial symptoms, and he can note whether high additive or chocolate affect these to any bothersome degree. Overall he has shifted from being worried about all food, to tasting to note mouth reactions, having small meals, not fasting, nor eating large meals when he is hungry, and now to feeling he can eat new foods, especially when away from home. Like other food-sensitive people, he is watching what aspect of the food, or his situation, affects his individual diet expansion. It is quite possible that if Jack had been put on a six-food-elimination diet he would have been one of the 10% non-responders, as his reactions were trigged by particular food chemicals (of the sort usually problematic for food-sensitive people), rather than by any of the suggested six whole-foods. This case study allows dietitians to consider that eosinophilic oesophagitis can be treated by incorporating the diet detective pathway to individual diet investigation of possible food chemical sensitivity. It is an example of patient-centred dietetics. There is so much individual variation in our patients it is wise to begin from the individual and look at what they specifically react to – rather than to any particular list of suspect foods. Our goal is to ensure that the patient has the broadest diet possible and to avoid strict diets if they are not necessary. Thanks Joan. A very helpful passage. But I wonder whether the sample size is too small? Have you considered about other influence factor, like weather? Case studies are usually of one patient. Often they do what this one does: highlight the possibility that the usual treatment may not be the only option in all cases. I am pleased you have mentioned the weather. I have with my patients been watching all the factors that also affect reactions for many years. Weather can make some difference but not the amount Jack found. the time-frame of this patient’s investigation was over 12 months. Note one of his bad reactions was in a plane. I, and all food sensitive people would be delighted if changing where you live could make such a big difference. You, and others, can learn more by going to my other Articles, and my books to learn about the idea of the Total Body Load of factors which may affect reactions. See especially Chapters 2 and 3 in Tolerating Troublesome Foods, available from my site, and also from Amazon-Kindle for just US$5.00. See https://www.amazon.com.au/Tolerating-Troublesome-Foods-Investigating-intolerance-ebook/dp/B00I7DS87O Enjoy learning more! This is very useful information! Thanks for that. I’ll notice the food in daily life more. So many thanks. Very interesting case of a very disciplined person. Keep up the good work. MNT at work. Food intolerant patients are very motivated. Jack was especially so as he wanted to maintain his own lifestyle, so he worked on understanding food smelt and felt in his mouth as a guide. I hope others learn from his clear descriptions and be confident to note and use their own. Thanks Jack! Thanks Joan! We’re aren’t taught ‘as a general rule’ to consider food chemical intolerance for Eosinophilic Oesophagitis. No Irma we are taught that the six food elimination diet is the treatment, though I know dietitians who are, to their credit, watching which of the six cause least reactions. Dietitians who listen to their patients story and take a Family Sensitivity History have the best chance of finding the best baseline diet and the best foods to do challenges with. Jack was great at responding to the diet and following up what worked for him. Thank you. Shows how important it is to check foods and reactions individually. For me, my biggest fear is rosacea outbreaks. Have yet to uncover culprit(s). Dear D’anah, I gather that rosacea is a distressing condition of reddening and change in the skin on the face. It is known to come on with different factors. The one most cited is alcohol, but there are others. I can let you know that I have not seen it in any food sensitive people. But in a way finding out what may make a difference is diet detective work too. You may even have to do it backwards such as excluding foods you may suspect such as spice, for a month and then put them back and see if that makes any difference. The trouble is that it may take a month for the skin to go wrong and a month to come good. I am sorry I cannot be more help but I can say that 50 years ago no one thought that the low chemical diet was useful so I support you in your investigation. You do need to follow up all medical options as I am sure you have done. Do work with an accredited practicing dietitian while investigating diet so you do not affect your nutrition while following your own inituitions. I wish you the assertive energy for the long haul you have ahead but do believe in yourself through the process.